सफाई अभियान की शुरुआत ! २ अक्टोबर से भारत में एक सफाई अभियान की शुरुआत हो रही है. मुझे लगता है की यह एक अच्छा कदम है और हर एक भारत वासी को इसमे जुड़ना चाहिए. आज के हालात इतने खराब हैं की आप किसी भी सरकारी दफ़्तर में जाएँ, किसी सरकारी अस्पताल में जाएँ, या किसी भी पब्लिक प्लेस में जाएँ, चारों तरफ गंदगी के ढेर मिलेंगे. 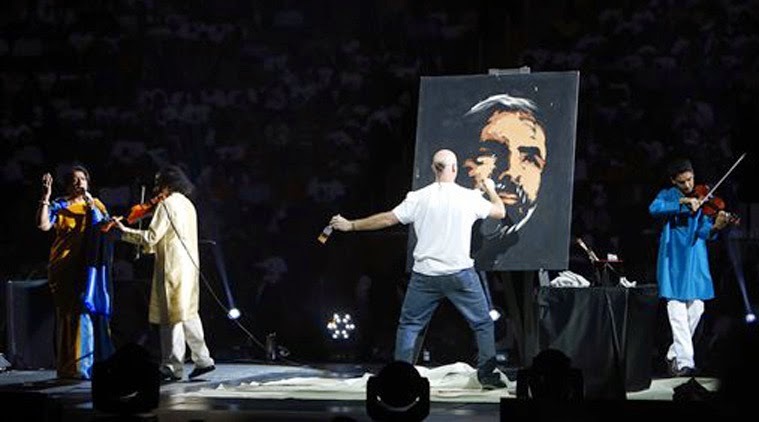 और तो और, पान क़ी पीक की पिचकारी तो ऐसी चित्रकारी करती है की दीवारों की हालत देख कर रोना आ जाए. सड़को के किनारों को बेशर्मी से पब्लिक यरिनल बना देना तो एक आम बात है. सबसे ज़्यादा सफाई की ज़रूरत है रेलवे लाइन्स की. रोज सुबह जब स्टेशन से ट्रेन निकलती है तो बड़ों बड़ों को भी बाहर देखने में शर्म आ जाती है क्योंकि इतना बड़ा ओपन, खुला टाय्लेट शायद दुनिया में कहीं भी नही होगा. इसके साथ साथ, यमुना के किनारों पर जहाँ गुजरात की तरह लोगों को घूमने का आनंद मिलना चाहिए, वहाँ पर झुग्गी झोंपड़ी वाले इतना गंद फैलाते हैं की घूमना तो बड़ी दूर की बात है, वहाँ से निकलना भी हो तो नाक पे रुमाल रखना पड़ता है. 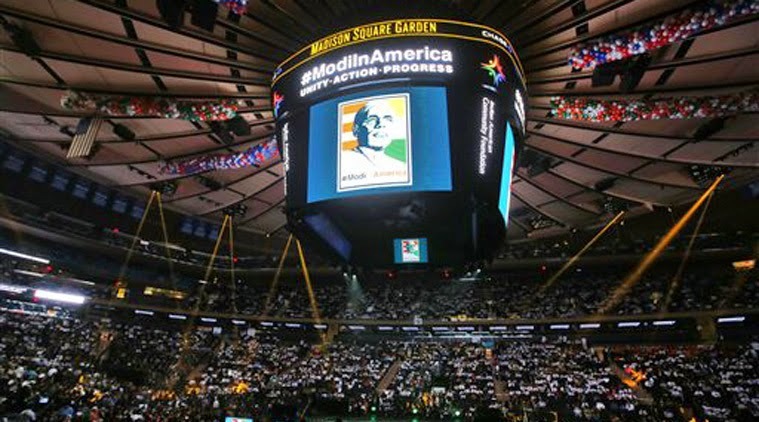 इन सब के साथ साथ, यमुना में किसी भी तरह का कूड़ा, गंद, पर्दूषण के केमिकल्स के फेंकने पर रोक लग जानी चाहिए. गली मुहल्लों के खततों की सफाई की नितांत आवशयकता है क्योंकि सफाई करमचारी तो सुबह अपना काम कर के चले जाते हैं और बचा हुआ कूड़ा सारा दिन उधर रहने वालों के लिए और उधर से गुजरने वालों के लिए मुसीबत बन जाता है. इस सब के साथ साथ, लोगो की मेनटॅलिटी भी बदलने की ज़रूरत है क्योंकि विदेश जाने पर हम बड़े सॉफ सुथरे होने का ढोंग करते हैं और अपनी ज़मीन पे पहुँचते ही अपनी औकात पे आ जाते हैं. मुझे लगता है की विदेशो की तर्ज़ पे, भारत में भी कूड़ा डालने वालों के खिलाफ सखत क़ानून होने चाहिए. इस मुहिम में सफलता सिर्फ़ तब मिल सकती है जब हम सब लोग इस मुहिम में जुड़ें क्योंकि ऐसा करने से हम किसी और का नही, बल्कि सिर्फ़ अपना भला करेंगे. 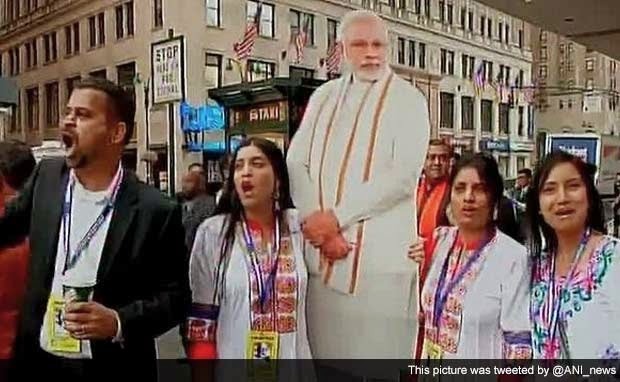 दिल्ली की सभी रेसिडेंट वेलफेर असोसियेशन्स को भी खुल कर सामने आना चाहिए. Delhiites : Join us on RWABhagidari Social Network ! 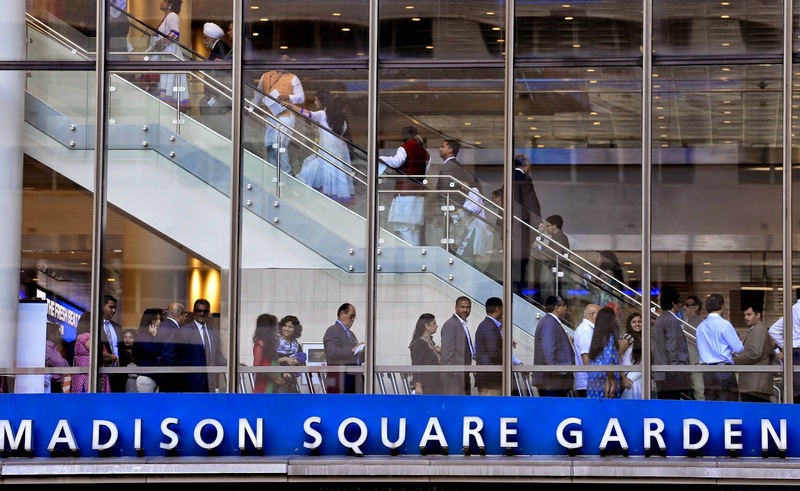 As 30th & 1st will be half year closing.... banks are working but may not be able to do all transactions. 4th is Saturday half day and backlog of last two days. 6th is Bakari Idd holiday... actually it's on 5th but Banks have declared on 6th & may not change. So complete your Bank work by 29th or wait till 7-8 October. Contaminated water for the last over 3 weeks ? Our colony has been getting contaminated water for the last over 3 weeks. It is reported that main sewerage system near Madhuban Chowk on Vikas Marg gave way resulting blockage of entire sewerage system towards Laxmi Nagar side. Due to leakages in sewer line as well as water lines caused the entire problem. With repeated vigorous follow up by us and other neighbouring colonies, DJB put some pumps to drain out the sewerage system, but even after three weeks, they have not been able to identify the leakages. Many residents fell sick due to contaminated water. They are using bottled water, but how long is a big question. DJB has failed to give proper satisfactory reply. This is the state of affairs after paying 60% of the bill amount for "sewer maintenance' plus service charge and other taxes. We request the CEO, DJB and the LG to take immediate strict action against those who are playing with the health of the public. We even approached the Union Health Minister, Dr Harsh Vardan, but no action seems to have been taken from his end as well. Circle rate of Property has been hiked by 20% by Delhi Govt. It will be applicable from tomorrow. More details awaited. We have one big Public park maintained by MCD in vicinity,named “neighbourhood park ,which is priviously Developed by DDA,now taken over by MCD for maintance .It is maintained beautifully and lot of grEenery and new benches were added recenty.But it has no supply of electricity in the evenings at all.it is mostly picthc dark in the evenings and night. We need the continuous supply of electricity for the tall lights and the lights on inner periphey for people who utilise this park for evening health walks/sitting peacefully in the evening.Bothe the tall lights are not working for last many months or may be 2 years now and periphery lights are interitantly or seldom switched on . There is a weekly Tezbazari bazar on Thursday on its outer periphery towards Swami ngar.so on Thursday , Garden becmes a thoroughfare for all the 5-6 surrounding localities (sheikh sarai-I,II,chirag Delhi,Swami nagar and savitri nagar (all surrounding colonies ) and it is very degerous for women and children and even elders to go through this park in Pitch dark to purchase vegetabes etc.otherwise also crime rate is high in SHEIKH SARAI AREA,SO MORE LIGHT IS A NECESSISITY. 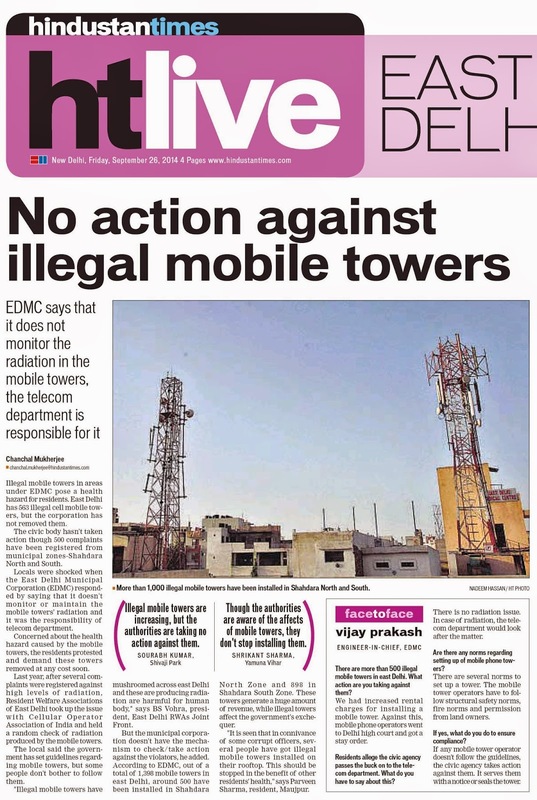 I request MCD to look into this matter urgently. NEW DELHI: Finnish scientist Dr Dariusz Leszczynski has criticised India-born oncologist Dr Siddhartha Mukherjee’s claim that there was no link between cell phone radiation and cancer. Dr Leszczynski was part of a global team that labelled cell phone radiation as carcinogenic in 2011. “I don’t know how he said this. I don’t know how well he is read and how much of expertise he has in cell phone radiations. I don’t think he read the hundreds of studies on cell phone radiations. He is an oncologist and I don’t know how much of research he has done on cell phone radiation,” said Dr Dariusz Leszczynski, who is also chief editor of ‘Frontiers in Radiation and Health’ and an adjunct professor, department of biochemistry and biotechnology, Helsinki University, Finland. “Extensive use of cell phone for more than 30 minutes a day for 10 years could increase the risk of brain cancer. There is enough evidence from studies to substantiate it,” he said. 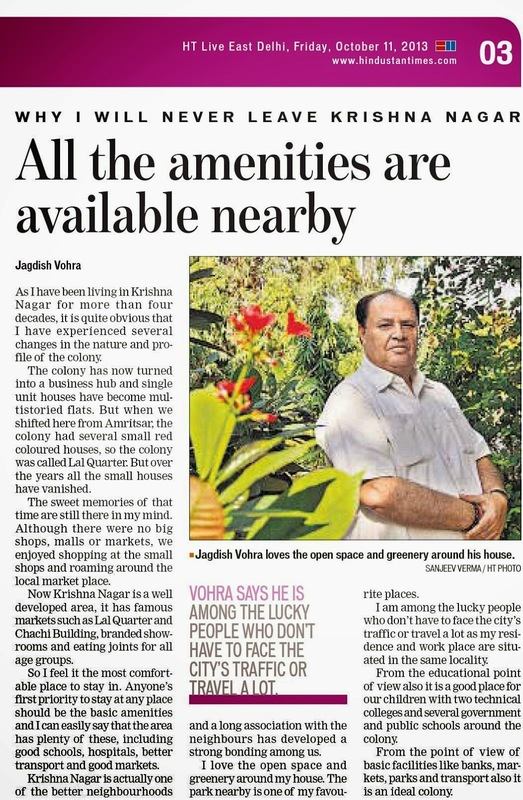 with thanks : HINDUSTAN TIMES : LINK : 16th September, 2014 Page 7, News paper for detailed story. MUST READ. 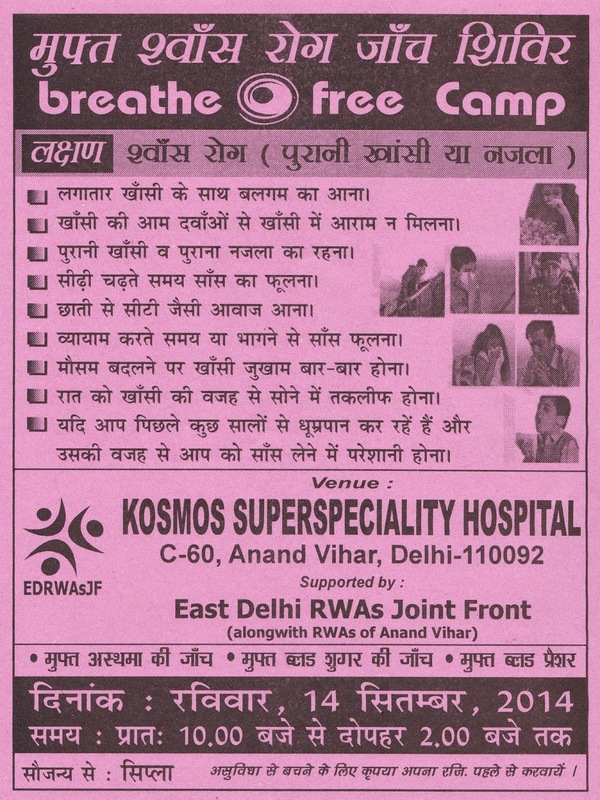 Lungs check up camp in East Delhi ! A Peak Flow Meter (Breathe-o meter) is a simple, affordable, hand held device which helps diagnose breathing problems and asthma in children and adults. It is also used as an instrument to monitor your progress when you are under treatment for asthma. Just as you have a BP instrument to check blood pressure and the Glucometer for diabetics, the Peak Flow Meter (Breathe-o meter) is like a thermometer for asthma. As a patient, you will have to blow into the mouthpiece of the device, and the reading will be taken to check your lung power. Most doctors have the device in their clinic but it is also available at most leading chemists if you want to keep your asthma in check. A Spirometry Test is a more sensitive and sophisticated test which detects the signs of asthma early. The Spirometer is used to measure how much air your lungs can hold and how efficiently the air moves into and out of your lungs. In other words, it gives a good indication of your lung power and gives you accurate details about your breathing capacity. The lab or the doctor conducting the test will give you a printed graph of your reading, just as you get a graph when you do your ECG test. Both the Peak Flow Meter (Breathe-o meter) and Spirometry tests are used to diagnose asthma and also help you measure your progress when your asthma is under control. However, since these tests are not recommended for children below six years of age, you as a parent have to work together with your pediatrician, to make sure that your child’s asthma is diagnosed early and correctly, by paying close attention to your family history and triggers. You will also be required to visit your doctor regularly so that together you can monitor your child’s progress. The detailed report is being expected in a day. Lungs Check Up camps in East Delhi ! 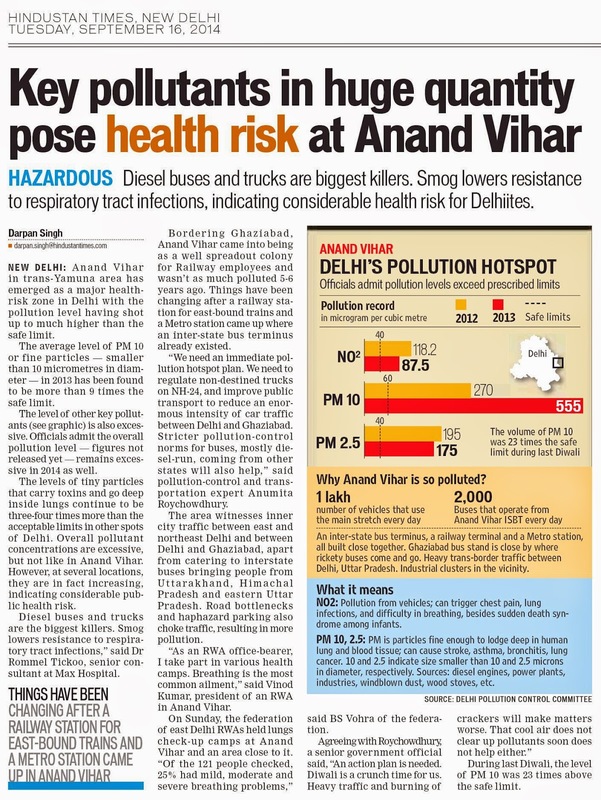 East Delhi RWAs Joint Front will organise a Lungs check up camp at Anand Vihar & Jhilmil on 14th September to view the actual impact of Pollution on the residents of the area, as published in our News story in Hindustan Times, few days ago. Kosmos Super Speciality Hospital, Anand Vihar, 14th Sept, Tomorrow, 10 am to 2 pm. Kali Mata Mandir, Vishwakarma nagar, Jhilmil, , 14th Sept, Tomorrow, 10 am to 2 pm. Next series of Camps will be announced soon. Serving the Nation. Our SALUTE to Indian Army ! Labels: Serving the Nation. Our SALUTE to Indian Army ! RWAs : attend the SFAC conference on Kissan mandi direct sales to RWAs ! SFAC is an agency of Ministry of Agriculture, Government of India. They work with farmers to mobilize them into produce organizations and link them directly to markets. SFAC is shortly launching a “Kisan Mandi” at Alipur in north Delhi, where produce from farmers will be sold directly to wholesalers, retailers, RWAs, and general public in Delhi/NCR. In this context SFAC is organizing a conference to explain the concept of Kisan Mandi and also identify retail sale points at various RWAs in Delhi/NCR. The date venue & time of the conference will be communicated to the RWA representatives. Last date for registration is 19th September, 2014. Free Lungs check up Camp in Delhi with CIPLA ! Increased treatment or hospitalization of people with lung diseases, such as asthma or chronic obstructive pulmonary disease (COPD). COPD includes emphysema and chronic bronchitis. Someone in every family is likely to be at risk from air pollution. Does someone you love belong to one of these vulnerable groups? "Responders" – otherwise healthy individuals who feel the impact of air pollution at lower levels of exposure than the average person. Please join us at the Lungs check up camp on 14th Sept. at Anand Vihar & Jhilmil. Details already posted on the blog. Next schedule of other areas to be announced soon. Labels: Most polluted Delhi ? Lungs check up camp at Jhilmil, Partap Khand near Anand vihar ! Labels: Lungs check up camp at Anand Vihar / Jhilmil - RTI says MOST POLLUTED ! Lungs check up camp at Anand Vihar - RTI says MOST POLLUTED ! Please feel free to join us on Facebook also, to be in touch & to share your views, opinion. Labels: Join us on Facebook ! Lungs check up camp at Anand Vihar / Jhilmil - RTI says MOST POLLUTED ! 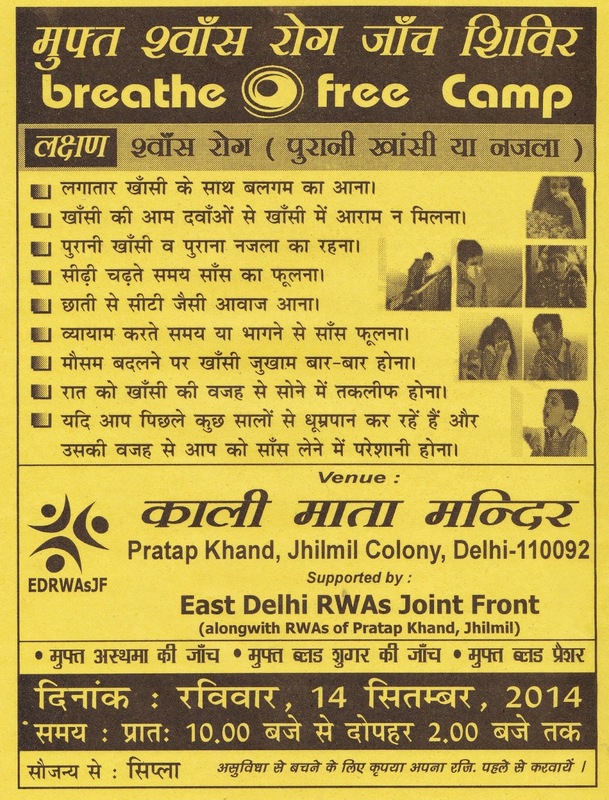 'East Delhi RWAs Joint Front', will organise a Lungs Check up Camp at Anand Vihar as well Jhilmil ( Partap Khand ) on 14th September 2014. The camp is being held to check the actual status of Pollution in these areas after the RTI by the Joint Front, revealed the areas as most polluted. Details of the Camp vide a pamphlet will be uploaded soon on the Blog. Those willing to get the lungs checked may feel free to mail us at the earliest. They may also contact Sh Balu ji, Sh Vinod ji, Sh Vinod kumar ji in the respective areas. Labels: Lungs check up camp at Anand Vihar & Jhilmil after RTI says it MOST POLLUTED ! Cause of air pollution ! Out of order DTC buses on FLYOVERS lying for several minnutes are the main cause of increase in pollution level.The buses are not removed from the flyovers leading to long jams & increased production of toxic airpollutants.Buses are repaired on site by mechanic who have to come from the specific depot to which the bus belongs.It takes along time.This process must be improved. Other cause is mismanagement of traffic signals by inadequately trained personnels.The signal is turned red when many vehicles are still to cross without any logical reason.Once the vehicles have started & are in motion ,it will take only few more seconds for many of them to cross.Maximum numbers should be allowed to cross when it is green.The signal lighting system should be managed in a way which gives maximum benefit to the people & causes least air pollution. Polluting & Unparked Delhi ! 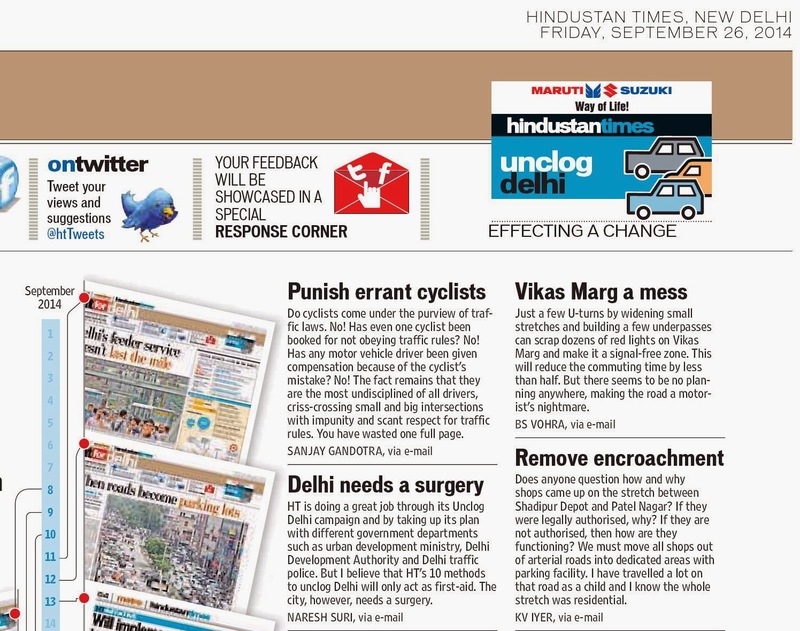 There is no doubt that both these issues are making DELHI as non living city. However if we analyze these problems to find out how is responsible then I find that the residents are most responsible. 2. WHO misuse parking spaces for living (car garrage in residential units for living) basements for storage/ shopping / offices etc- violating rules. 5. permitting mixed land use with following all norms and use streets for parking. 3) Ban E Rickshaws as they are bigger Pollutant when they dispense with there BATTERIES at your back in THREE MONTHS usage as it contains heavy Pollutants which would pollute the ground water too as in Surat etc.Lets go for human pedaled Rickshaws as last mile vehicle as in the west.Besides they stael power at Rs25Cr/per month by kattiay usage and we pay for the same so annually we foot Rs 500Cr and the same will be reflected in already high Tariffs.These e-rickshaws can ply at outer eg at Noida,Akshdam,Fardiabad, guragaon where there is no last mile connectivity. 5)All cemented space in front of your houses/offices/pedestrian path ways(If any) after encroachments lets us Plant 'FRUIT TREES' not Eucalyptus etc with heavy foliage and use a 'Plant" as the 'GIFT" for all occasions.As we have in Lyutens Delhi,the British did that so why we can not ape them as we ape all of Western culture?? But are we willing to sacrifice our easy life styles for our progeny or make them gradually die with slow asphyxia with this POLLUTION. Choices are yours dear.If China can be where it is by pedaling away why we can not?? Polluting Status of Delhi ! 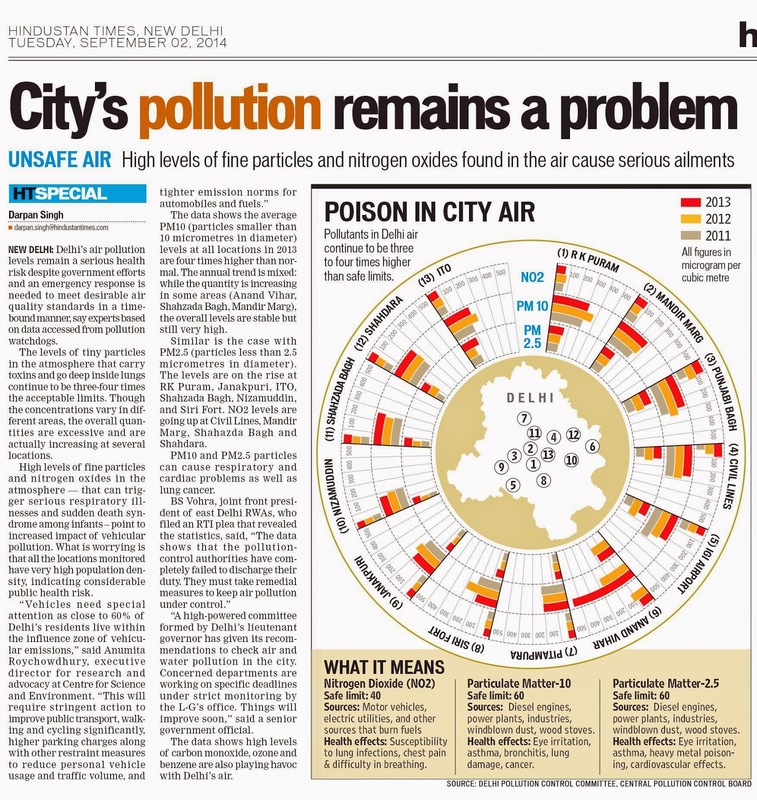 Everyone is shocked on viewing the Polluting Status of Delhi, vide our RTI, published in Hindustan Times on 2nd of September, 2014. 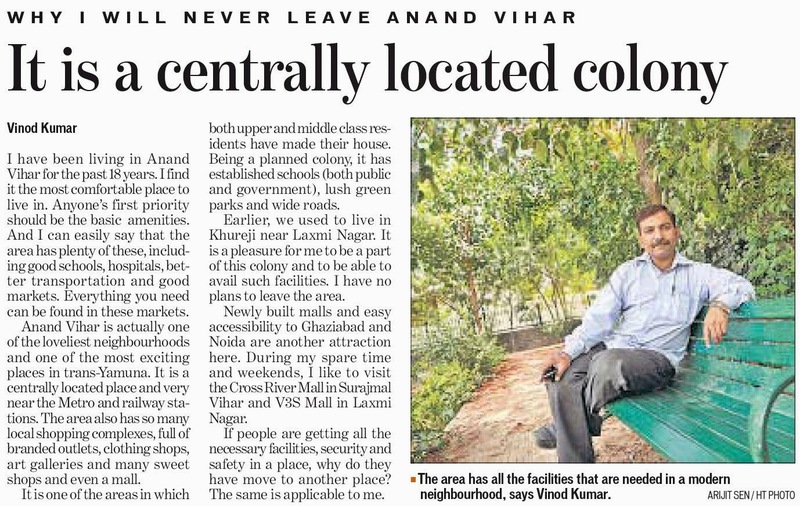 The covered areas included : R K Puram, Mandir marg, Punjabi bagh, Civil lines, IGI Airport, Anand vihar, Pitam pura, Siri Fort, Janakpuri, Nizamuddin, Shahzada bagh, Shahdara, ITO & 3 more locations with incomplete data i.e. Sarojini nagar, Mayapuri Indl Area & Chandni Chowk - Town Hall. Most polluted was the Anand Vihar. Therefore, on next sunday we have a plan to check the Lungs of the residents of the Most Polluted Anand Vihar & nearby Jhilmil - Partap Khand areas, to understand the exact situation. We will move further to other polluted locations of Delhi soon. More details will be updated on the blog at the earliest possible. Those living in the Anand Vihar, Jhilmil, Partap Khand & nearby areas may contact Sh T K Balu ji, Sh Vinod ji & Sh Vinod Kumar ji in respective locations. You can also mail us your contact number in this regard. Labels: Polluting Status of Delhi ! Comments : Pollution levels in Delhi.